La Otra Carboneria, is a squatted community space next to mercat Sant Antoni. Every Thursday they host a vegan dinner, open to all. The food is tasty, simple and satisfying. The atmosphere is loud, friendly and relaxed. Yes you will stand out a little as a guiri but nobody cares really. 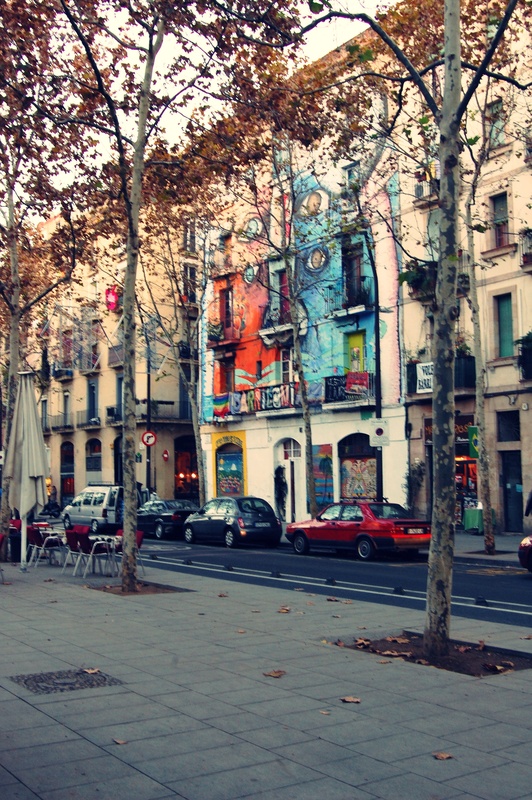 If you wanted to dip your toe in the social/community/alternative living scene in Barcelona, this is a good place to start. They also host art exhibitions, a free shop (exchange stuff you no longer need for stuff you do), workshops and talks. Go with a group of friends and get a table to yourselves, or go alone and perch at the bar. It’s all good. Payment is by donation. Give what you can, a euro, a couple of euros or more. Beer is one euro. La Otra Carboneria describe themselves as free space for people to collectively create and fight a city model which wants to sell everything. A model which treats people as little more than scenery in the ‘Barcelona Theme Park’. 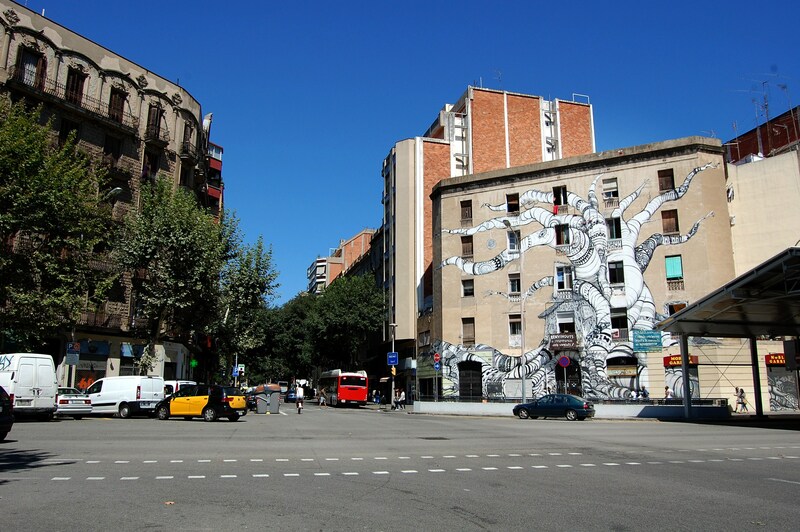 Visit them at the junction of Carrer Urgell with Carrer Floridablanca. Oh the shame of it! I’ve become a symptom of my time. Head down, scurrying out to work and then wandering home, always lost inside my myopic little world of worries; it took a facebook post for me to realise my neighbourhood squat has been evicted and bricked up. Now Barrialonia, as it was called, was not just a squat. It was a community center. It used to host concerts, political meetings and community parties. They celebrated Id last year by cooking up a massive pot of biriyani and setting tables and chairs out on La Rambla del Raval for an open air picnic for the neighbourhood. They organised makeshift movie nights on the Rambla with a small projector and screen, and anyone interested just had to park their bum on the street and get comfortable. They hosted debates and talks about Real Democracy and kept the movement alive between the more high-profile marches. The council’s reasons for shutting the squat down are ‘structural concerns’ with the building. They used similar excuses to shut down other squats in Barcelona in the past, including la Makabra, Miles de Viviendas and Ruina Amalia. In all these cases, the squats served as community centres which hosted art classes and exhibitions, spaces for political debate and spaces to celebrate cultures. What follows is usually either swift demolition of the building or comprehensive bricking up of all entrances, which is then followed by….. nothing. They won’t attempt to replace the space with a council built community center, sports center or art space. They can’t afford to. That much is blatantly obvious, this being an economic crisis and all. So why go and kick the sand box over in the first place? Is it so bad to have people with initiative doing something in their community? Dear government, haven’t you realised it is the people with ideas, opinions and initiative who will save you from this nightmarish crisis? Crowds gathered in Placa Sant Jaume last night to protest police brutality against student protests in Valencia. Unarmed students were intimidated, roughed up and beaten while attempting to protest against budget cuts in Universities. Police reaction which was cited as being ‘proportional to the threat’ sparked outrage across Spain. It was good to see the protests last night because it wasn’t just the students and young hippies/punks/anarchists. There were working class and middle class old couples in their 50s and 60s holding up placards ‘for the children of Valencia’ and shivering in the cold night air, wizened faces set in determination. When I mention how threatening the riot police look, the old man smiles. ‘The mossos aren’t scary, its nothing if you have run in front of Franco’s grey police. We had to when we were students’. There is no successful divide and rule policy here. The aged stick with the youth, the students stick with the workers and every one of them believes in real democracy.